More than 75,000 people have followed her weight-loss journey on Instagram. Stunning Jennifer Ginley has already attracted more than 75,000 fans on social media with her remarkable transformation, which has seen her halve her body weight in just over a year. Now she’s hoping to inspire even more people after winning a national award for her weight loss and becoming the cover star of a top magazine. The 26-year-old, whose Instagram followers have watched her lose 9st 9lbs and drop nine dress sizes, has been named Slimming World’s Miss Slinky 2017 and will grace the cover of the March/April 2017 issue of Slimming World magazine. Her weight-loss journey began after Jennifer was forced to buy size-26 clothes for a once-in-a-lifetime holiday to Florida with her family and was left devastated by the photos from the trip. I might be half the size but I feel like I’m double the person now! Jennifer, who lives with her mum Janet in Liverpool, says: “I’d been a fairly averaged-size child but I was a size 18 by the time I went to university in Manchester. Living away from home saw me gain even more weight and I was around 5st heavier when I graduated. I’d tried so many diets in the past, but all of them seemed to make food the enemy, so I never addressed my relationship with over-eating and nothing seemed to work for me. In fact, Jennifer, a Citizens Advice caseworker, says that the biggest change since her 9st 9lbs weight loss has been to her positive mentality: “Before I lost weight I had a massive lack of belief in myself and I feel like I wasted so many years with fake smiles that hid how unhappy I was. I was a serial failed-dieter and could never understand how I could achieve so much in other areas of my life, yet I couldn’t control what I ate. Finally taking control of my weight was such a huge turning point for me, both physically and mentally. New bride-to-be Jennifer has dropped from 19st 4lbs to 9st 9lbs and from a dress size 24/26 to a 8/10. 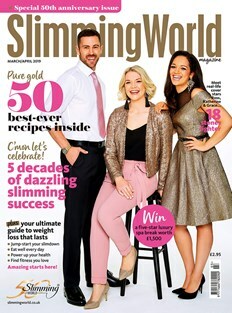 On top of hitting her weight-loss target, getting engaged and being named Miss Slinky 2017, Jennifer’s also ticking another ambition off her ultimate wish list – being the cover star of the March/April 2017 edition of Slimming World magazine. She says: “I honestly can’t believe all of the amazing things that have happened to me since I first walked through the doors of my Slimming World group.